For starters: KML (Keyhole Markup Language), is an XML file format for modeling and storing geographic features such as points, lines, images, polygons and models for display in Google Earth, Google Maps. KML Converter is a free utility to convert any CSV file into simple Google Maps KML file. It has basic functionality of converting coordinates from DMS format into decimal degrees and converting altitude values from various units of measurement to meters. 1. Download KML Converter utility, unzip & launch it. 2. Click Browse button to select the source file. 3. Configure Column date format settings. 4. Click Export to KLM button for the final KLM format file. 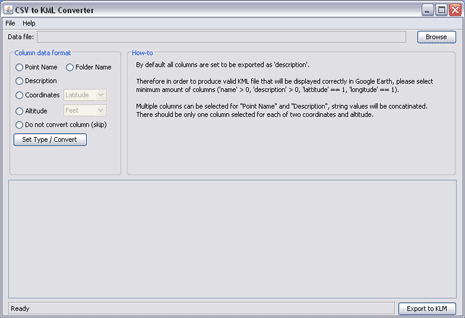 This free converter is useful for basic CSV to KML conversion. Developer plans to add more features to this converter utility, keep checking release webpage to track development.